Ronald Darby, left, walking out for his first practice as an Eagle with Rodney McLeod. Good morning. The first wave of free agency has passed, but the Eagles news won’t halt. The NFL’s league meeting will be next week in Phoenix, where the Eagles’ top officials will convene. Doug Pederson will have his annual hour-long, roundtable interview with reporters Tuesday. So while you’re analyzing your NCAA Tournament brackets, make sure you check Philly.com for the latest from the Eagles. This is an offseason edition of the Early Birds newsletter. I want to know what you think, what we should add, and what you want to read, so send me feedback by email or on Twitter @ZBerm. Thank you for reading. Ronald Darby adjusting his gloves during an Eagles practice last October. The last two transactions the Eagles made focused on the secondary: re-signing cornerback Ronald Darby and adding safety Andrew Sendejo. Keeping Darby on a one-year deal was a sensible move. He’s a talented cornerback when healthy, but coming off a torn ACL is not an ideal way to enter free agency. This gives him a chance to reset his value while the Eagles retain a starter on a one-year deal that is below the value Darby would have received had he been healthy. It reminds me of when the Eagles kept Jeremy Maclin in 2014. Maclin, by the way, had a career year and signed a lucrative contract in Kansas City the following offseason. I didn’t view signing Darby as a necessity because the Eagles were well-stocked at the position with young, developing players. 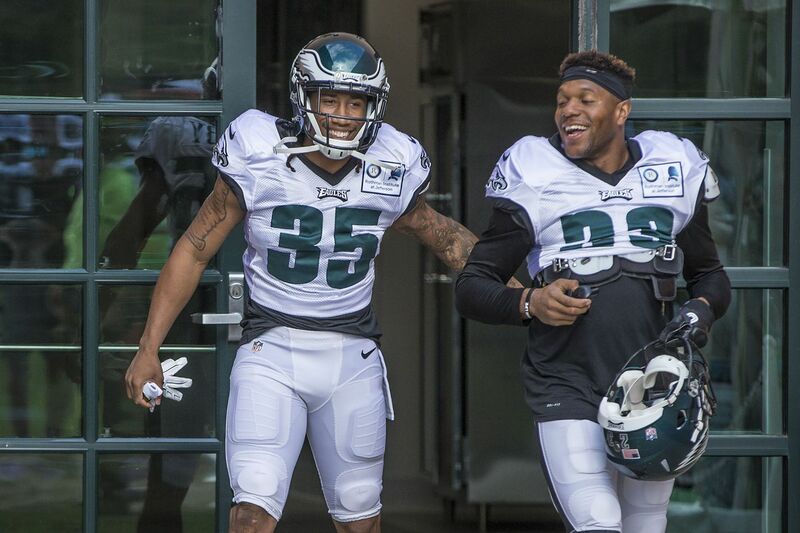 I thought the key to the offseason in the secondary was the development of those cornerbacks — Jalen Mills, Sidney Jones, Rasul Douglas, Avonte Maddox, and Cre’von LeBlanc — as opposed to adding reinforcements. If those were the top five cornerbacks entering the season, the Eagles wouldn’t have been negligent. But keeping a 25-year-old, in-his-prime starter makes it only better. Of course, Darby must get healthy — he said he’ll be ready by Week 1 — but the Eagles have the pieces to have a good cornerback group next season. The question now is how they’ll be deployed. Will Mills start when healthy like last season? Will Jones play the slot, or will Jim Schwartz keep him on the outside? How do the Eagles use Maddox? These are all questions to figure out during training camp. It’s not yet settled, but it’s better to have options than what the Eagles had at this time two years ago. In Sendejo’s case, the Eagles added an experienced player to replace Corey Graham as the No. 3 safety. The Eagles used their three-safety formation for more than 60 percent of the defensive snaps during the postseason; it’s more important than their base package. Sendejo isn’t a top-of-the-league starter, but he’s a good solution for the No. 3 safety. Overall, the secondary is better than it was one week ago. Defensive backs coach Cory Undlin should be pleased. I thought the Eagles would make a concerted effort to get younger this offseason. That hasn’t been the case. Look at the ages of the four additions: Malik Jackson (29), DeSean Jackson (32), L.J. Fort (29), and Andrew Sendejo (31). I’m not suggesting the Eagles should have set the market in free agency. But the Eagles’ starting lineup includes Brandon Brooks, Malcolm Jenkins, Rodney McLeod, Alshon Jeffery, and Nigel Bradham — all high-level players who signed with the Eagles in their mid-20s. The Eagles have taken a different approach the past two years. There’s great potential in finding undervalued older players. Chris Long and Patrick Robinson were terrific signings. But this approach didn’t necessarily work for the Eagles last offseason. If you’re going to make smart gambles, as Howie Roseman likes to do, then it’s often best to target a certain age profile. In the Eagles’ defense, re-signing Darby and keeping Nelson Agholor are similar to signing free agents from another team at that age. (The Eagles also kept 37-year-old Jason Peters and 30-year-old Brandon Graham.) And the draft will be an important outlet to find young, contributing talent. But I’ve seen much attention during the past week go to the Eagles’ strategy of accumulating compensatory picks. And while that has its merits, so does spending on starting players such as Jenkins, Brooks, Jeffery, McLeod, and Bradham who could spend their prime years with the team. The veteran backup-quarterback market is shrinking. Tyrod Taylor (Chargers), Teddy Bridgewater (Saints), Blake Bortles (Rams), and Ryan Tannehill (Titans) all landed No. 2 jobs and have notable starting experience. A.J. McCarron (Texans) and Brett Hundley (Cardinals) both landed backup jobs, too. Add in Ryan Fitzpatrick, who is on path to start with the Dolphins, and there are not many options at the moment if the Eagles are looking for someone to compete with Nate Sudfeld. My guess is Sudfeld’s presence complicates the search. The Eagles want Sudfeld to compete, but why would an established backup come in and compete for the No. 2 job? Nick Foles didn’t do that two seasons ago. Mike Glennon, Trevor Siemian, and Brock Osweiler are among the experienced backups still available. The Eagles could wait until the draft for a developmental quarterback to compete with Sudfeld, but then they wouldn’t have a No. 2 with starting experience on a depth chart topped by a starter who has ended the past two seasons injured. Eagles quarterbacks Carson Wentz (11) and Nate Sudfeld (7) during a practice last May. Ronald Darby expects to be back by Week 1, Paul Domowitch writes. What did the beat writers think of the Andrew Sendejo signing? Haloti Ngata retired after 13 seasons, including 2018 with the Eagles. Has DeSean Jackson changed his diva ways? Jeff McLane explores. Where does the Eagles roster stand after free agency? What’s the latest with Chris Long? Find out from McLane. Whats happening at both gaurd spots? How are we looking if both Isaac & Brandon have to miss time? Isaac Seumalo will start at left guard, and Brandon Brooks obviously starts at right guard when he recovers from his torn Achilles tendon. But you bring up a good question about the reserve interior linemen, because the Eagles did not pick up the option in Stefen Wisniewski’s contract. The top reserve guard next year will be Matt Pryor, whom the Eagles like. Jordan Mailata gets a lot of attention when discussing last year’s rookie linemen, but I can tell you there’s optimism about Pryor. The 6-foot-7, 338-pound, sixth-round pick did not play last season, although he had a good preseason and developed behind the scenes. This will be an important offseason for him. If Jason Kelce were to get injured, my guess is Seumalo would slide over to center, so Pryor would need to step into a game if any of the three interior linemen were injured. The Eagles could also add a veteran center/guard or draft one in April; the depth chart is unsettled. But Pryor is the option at the moment.